Rutgers University Press, 9780813588247, 222pp. 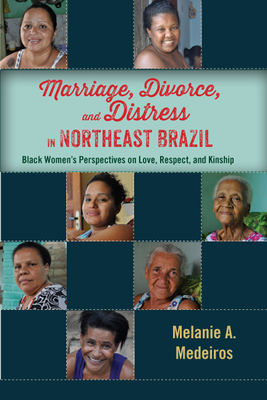 Using an intersectional approach, Marriage, Divorce, and Distress in Northeast Brazil explores rural, working-class, black Brazilian women’s perceptions and experiences of courtship, marriage and divorce. In this book, women’s narratives of marriage dissolution demonstrate the ways in which changing gender roles and marriage expectations associated with modernization and globalization influence the intimate lives and the health and well being of women in Northeast Brazil. Melanie A. Medeiros explores the women’s rich stories of desire, love, respect, suffering, strength, and transformation. MELANIE A. MEDEIROS is an assistant professor in the department of anthropology at The State University of New York College at Geneseo. "From the opening vignette, this vibrant, conceptually sophisticated, and yet accessible ethnography draws us into the contested terrain of intimate relations and divorce in Northeast Brazil. Medeiros skillfully depicts the voices and experiences of rural, working-class women of African descent, helping us see how their lives are shaped both by their own strivings and by forces as diverse as telenovelas and ecotourism. Her work represents a valuable contribution to the emerging anthropology of divorce as well as to work on emotion, gender, race, class, companionate marriage, social suffering, and even the anthropology of tourism."